The Exus Lens Protect range from Marumi is designed to protect the camera lens, it is a clear, transparent filter with surface reflection of less than 0.3% that does not affect the visible light range. In addition to its excellent low-reflection characteristics, the filter features a new antistatic coating that protects the lens from static clinging of dust and offers stain-resistance with easy cleaning of water spots and fingerprints. Compare to a conventional lens protect filter, the Exus filter glass has improved flatness and intensity. 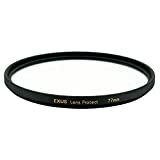 Designed to protect a camera’s expensive lens system from scratches and impact, Exus lens protect is essential gear for any style of SLR photography.Features:Antistatic Coating- Stress-free photography sessions are made possible by virtue of the antistatic coating that inhibits static clinging of microscopic dust. Even if the lens gets soiled, dust can be easily removed using an air-blower.Water and Oil Repellent coating- The surface of the filter lens is specially coated to offer excellent water and oil repellent performance. The surface repels water spots and provides resistance to fingerprints, and those few that appear on the surface can be easily removed.Ultra low reflection – less than 0.3%- Because the entire outer rim of the lens is treated with black-ink and features a special frame structure, the filter achieves ultra low-reflection of less than 0.3%. With suppression of surface reflection the filter brings out the camera’s lens performance to its maximum, achieving excellent image quality.Ultra low reflective frame- The filter mount features multiple light-blocking ridges to eliminate flaring and ghosting caused by diffusion. Other features include Ultra thin frame design, light blocking ridges, stain finish, knurling, attachable lens cap. This entry was posted in Discount Photography and tagged 58MM, Exus, Filter, lens, Marumi, Protect by Ball Photo. Bookmark the permalink.